On An Overgrown Path: Who cares about the wishes of a dead composer? Who cares about the wishes of a dead composer? 'I believe that the Eighth Symphony was not the only work which Sibelius destroyed... He spoke again and again about the unpublished works of his youth, with evident disquiet. He was oppressed by the though that after his death they would be taken out of their hiding place and made public'. Those are the words of Santeri Levas who was secretary to Sibelius from 1938 until the composer's death in 1957, which includes the period when he worked on the Eighth Symphony. The sketches which have recently surfaced may not be youthful works, but am I the only one to feel rather sad that the composer's explicit wishes are viewed as less important than the media opportunity offered by a playthrough of "the possible initial draft of the Eighth Symphony"? Will the next advance in Sibelius scholarship be to ignore the composer's wishes as expressed in the scores of his extant symphonies? * The header photo of Sibelius at home was used in an earlier post about my visit to the composer's house at Järvenpää. Header quote is from Sibelius, a personal portrait by Santeri Leavas. Any copyrighted material on these pages is included as "fair use", for the purpose of study, review or critical analysis only, and will be removed at the request of copyright owner(s). Report broken links, missing images and errors to - overgrownpath at hotmail dot co dot uk Also on Facebook and Twitter. Sibelius may be my favourite composer. I discovered him through the superb chapter of Alex Ross' "The Rest Is Noise," and I have long felt a sadness that I will never get to hear his eight symphony. It is the same sadness that I feel whenever I consider how young Gershwin was when he died. What could have come from Sibelius but for his attacks of self-doubt is a tantalizing thought. If someone were to come across the eighth symphony in its finished (Or is that Finnished?) form tomorrow, I would be tempted to listen. Ultimately, though, I think I would rather live with the sadness. 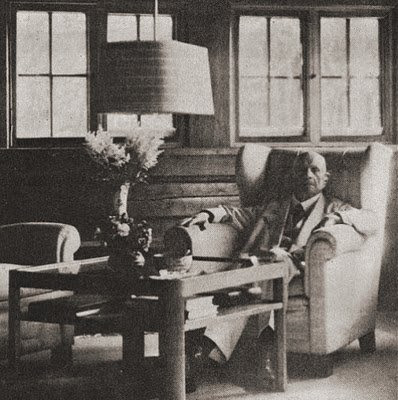 Beyond the fact that it was Sibelius' explicit wish that the work never be heard, the sadness, and the romance of what remains unknown, is as much a part of my love for the idea of the man and his work as anything else. There are those who will always want to dig for more, and understandably enough. But what happens when we answer all of our questions? What will happen when we answer all of our questions is that we will try to answer the question of what happens when we answer all our questions. The postmortem examination of Sibelius' works has been well underway for some years. Remember the original versions of his 5th Symphony and Violin Concerto issued by BIS? Interesting though they were, what I inferred from the experiment was that the composer was a superb editor who knew well what to keep and what to cast away. I have no doubt that Sibelius what needed to be done. No matter the author, not every utterance is necessarily worthy of preservation. I find myself similarly uneasy about this. I'm a massive fan of Sibelius's music and will go to great lengths to hear it, but I can't really get excited about the '8th symphony'. Whenever I hear the 7th I don't really want to hear anything else after it. Indeed, when it was done at the proms this summer before the interval (a weird programming choice), I ended up switching off the radio. The difficulty of how you follow that masterpiece seems to me a pretty convincing explanation for why Sibelius never did. Of course, what we have here can't really be described as the 8th symphony, but rather a couple of minute long fragments that might have come from it. At best, they are of academic interest, and given the vehemence of the composer's wishes on the subject, I'm inclined to the view they should be respected. It is true that sometimes artists can be over-critical of their work and gems can languish unpublished, but it is tough to make such a case on what remains here. Did he not leave more than enough completed gems for us to be satisfied with? Interestingly, though not really the same thing, I never find Bruckner's un-numbered symphonies especially satisfying. Nor, as a rule, am I a big fan of completions, which generally don't feel whole to my ears. The old chestnut of composer's intentions... do we want to learn more about people? Seemingly, by creating blogs and writing about them constantly, the answer is yes. Documents surface that we've never seen before. Letters, scores. Do we engage with them or do we burn them? It would be crazy to do the latter, but that would be following Sibelius's example. Respect, by all means, but let's not build more pedestals. Gavin, no one is suggesting burning anything or building more pedestals. What is being questioned is both the wisdom and the ethics of trying to unburn what Sibelius himself burned. Surely one of the few completions which really does succeed in artistic terms is Anthony Payne's superb realisation of Elgar's Third. I, for one, am grateful that Elgar's command to his friend W. H. Reed - "Don't let anyone tinker with it" - was overruled by the Elgar family. Then again, Elgar's notes for the Third seem to have been preserved in a far more comprehensive condition than were the scraps of Sibelius's Eighth which survived the Ainola bonfire. You can't unburn what Sibelius burned... but you can question why he did it. And you can present what he didn't. And if we can move towards knowing what that piece might have been like, then I want to hear it.